Once upon a time, a long time ago, there was nothing on earth but Abundance. Prometheus, god of forethought, and his brother Epimetheus, god of hindsight, fell in love with the same girl. Her name was Pandora. Each brother had his own strengths and weaknesses, and Pandora was endowed with an ample amount of curiosity. She enjoyed the attentions of both gods. Pandora’s fun did not last long. Zeus, who also happened to be Pandora’s father, grew angry with Prometheus and sent him away. With Prometheus out of the picture, Pandora enjoyed the spontaneity of life with Epimetheus. The two decided to find a place amongst human kind and shack up. Before she left, Zeus handed his daughter a beautiful box. He told her she could keep it as long as she never looked inside. When she first set eyes on the glitter of jewels and ornate carvings, the exterior was so lovely that she did not think much about what might be within. Pandora agreed to listen to her father. She crammed the box with the rest of her things and left home for the great, wide world. 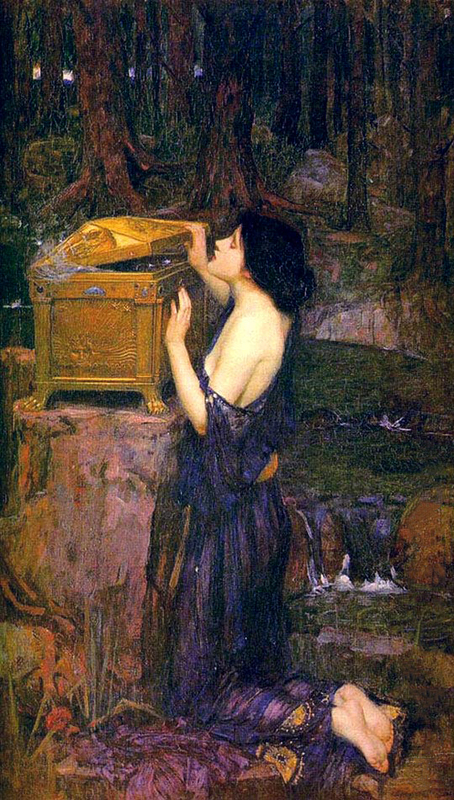 When Pandora unpacked, she found the gift from Zeus. What secrets lay hidden inside that box? As soon as Pandora asked herself the question, she had to know the answer. She kneeled down and popped the lid open just a tiny bit. Only enough for one quick peek. When she tried to close the lid, it would not shut. She pushed and pushed, but something fought her from the other side. The lid opened wider, and out soared Strife and Fear with all our human struggles in tow. They flew across the earth and stole from Abundance wherever they landed. Frightened, Pandora tried to close the lid, but it flung wide. Out stepped Hope. She flashed a smile and a double edged sword. “I laugh as I strike,” she said and sailed off to chase after her brothers. So it is as it always has been. Before we had our struggles, we also had no Hope.